From 1955 until 1969, the Kahn's company issued fifteen baseball sets, in addition to nine basketball sets. Kahn's was headquartered in Cincinnati until it was purchased by Consolidated Foods in 1966. The 1955 and 1956 Kahn's sets feature only the hometown Reds. The Pirates were included starting in 1957 and the Phillies in 1958. 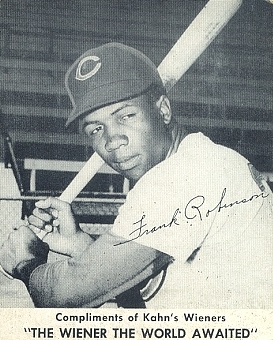 The Indians were added in 1959, followed by both the Chicago Cubs and White Sox in 1960. The 1961 Kahn's set dropped the number of teams to the Reds, Indians, and Pirates. In 1962, Kahn's added the Minnesota Twins to the set. The 1963 set was unusual, as it included the Reds, Indians, Pirates, and, for the first time, the Yankees and the Cardinals. 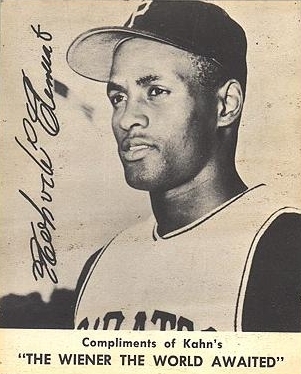 The 1964 set was the first to introduce color and featured only Reds, Pirates, and Indians players. The 1965 and 1966 set added the Milwaukee Braves before they moved to Atlanta at the end of the 1965 season. The 1967 set had numerous variations and included the Braves, Reds, Indians, Mets, and Pirates. The 1968 set added the Tigers and both Chicago teams to the previous year's set. And the final year of vintage Kahn's cards featured the Braves, Cubs, White Sox, Reds, Indians, Pirates, and Cardinals. All Kahn's cards are somewhat hard to find because they were packaged with hot dogs, so many of the cards have stains from the grease and water that were in the packaging. Some of the first few years have a waxy coating that protected them from the juice, but most cards that have survived are low-grade. If you are interested in selling any Kahn's cards, please click here.